SANFORD - Defusing crises without the use of force was the focus as 17 representatives from 13 North Carolina community colleges gathered at Central Carolina Community College to learn Nonviolent Crisis Intervention Training (NCIT). 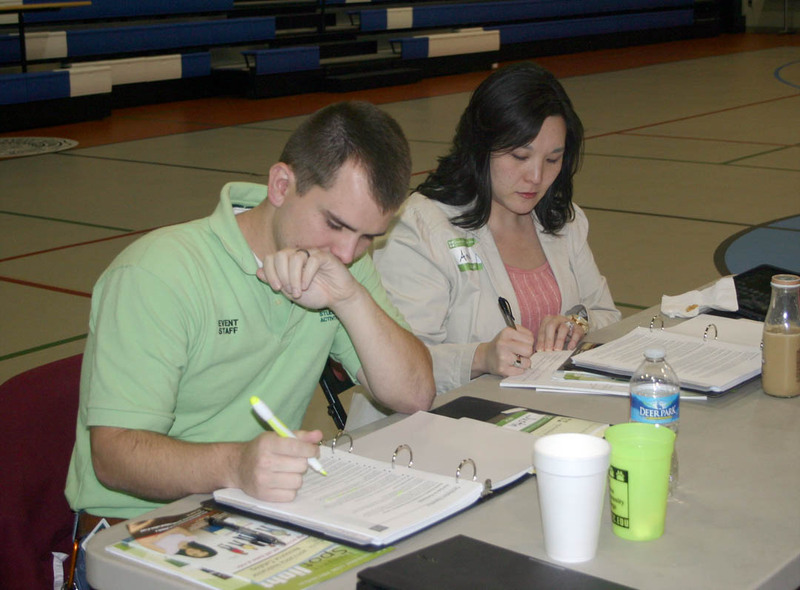 During the workshop at the college's Lee County Campus, each became certified as an NCIT trainer, prepared to take what they learned back to their campuses. There, they will train faculty and staff in dealing with crises that can erupt when a student or someone else on campus is out of control. "It is an exciting time at CCCC when we are able to provide training opportunities for ourselves as well as our colleagues at other institutions," said Theresa Cry, CCCC director of Organizational and Professional Development, who coordinated the workshop. "It is critical that the college provide proactive training that we all can benefit from in our student interactions." Those taking part included college deans, directors, a campus police chief, program and admission coordinators, and instructors in career and technical education programs. All agreed NCIT is important in order for faculty and staff to have the skills to de-escalate crises that might occur on campuses. Among those taking part was Andell McCoy, Stanly Community College's retention specialist and coordinator for the college's Minority Male Mentoring program. She said that, with the declining economy, more people are under greater stress and at greater risk of losing self-control. "I have my master's degree in psychology and this training connects very well with that," McCoy said. "It's great to give people a formal framework to work with out-of-control situations and to help people regain their control without any painful restraint. It's all about safety and caring." The skills learned at the workshop included empathetic listening, verbal intervention strategies, understanding how faculty and staff behavior affects student behavior, setting effective limits, preserving and strengthening relationships with coworkers and students, and using nonverbal responses to help defuse a crisis moment. Some techniques were learned for safely restraining an individual when that person or someone nearby is in imminent danger from the behavior. 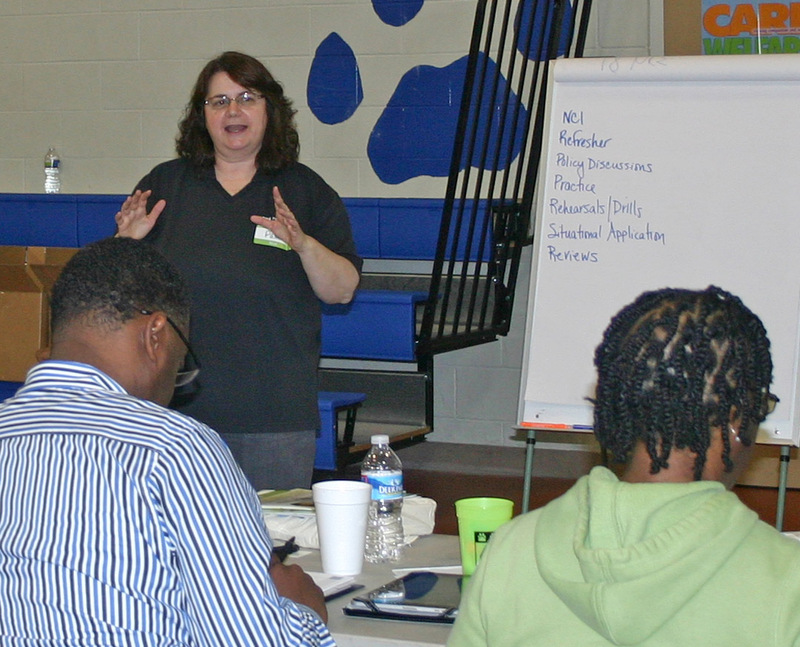 Pam Roncone, a Nonviolent Crisis Intervention Training instructor for the Crisis Prevention Institute, headquartered in Milwaukee, taught the Oct. 24-26 NCIT "Train the Trainer" workshop. She said she moved from a career as a probation worker in Chicago to NCIT training 10 years ago because it is so important that people learn these skills. 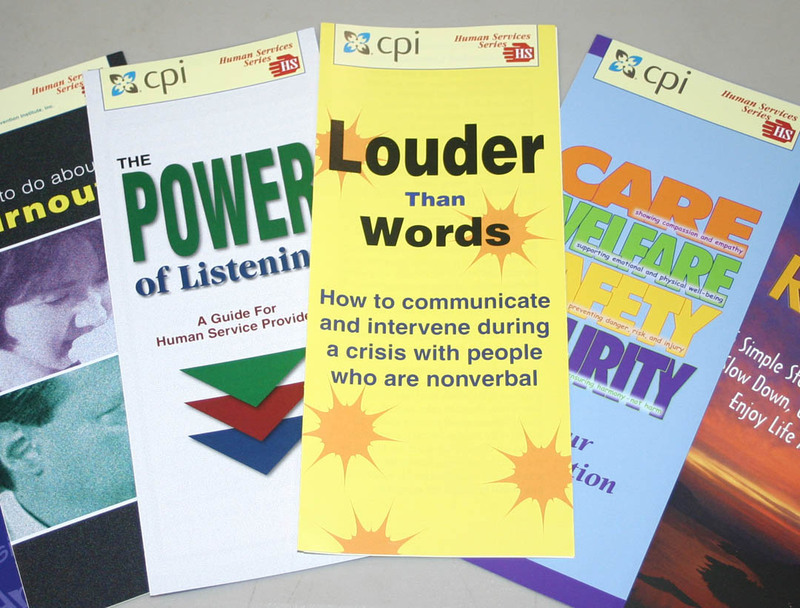 CPI was established in 1980 for human services professionals to address the need for crisis prevention and intervention training in safe, respectful, noninvasive methods. Its Nonviolent Crisis Intervention Training is the most widely used program in the world for managing disruptive and assaultive behavior. The NCIT "Train the Trainer" workshop was brought to CCCC after a student in instructor David Leperi's Early Childhood Education class asked if the college could provide crisis intervention training. He researched what was available and found CPI's program. "NCIT is important for faculty and students in that it presents an innovative and practical approach to enhancing the skills of college personnel and students in dealing with the defusing of disruptive behaviors before incidents escalate to a crisis situation," Leperi said. "The safety of all faculty, students, and children is the NCIT primary goal." Brian Merritt, CCCC director of Grants and Sponsored Programs, was able to obtain a $30,000 Professional Development Activities grant from the N.C. Community College System to bring the "Train the Trainer" NCIT program to the college. Also participating from the college were Markita McCrimmon, Justice Studies lead instructor, and Sue Boyd, Early Childhood instructor. At CCCC, the goal is to train career/technical education faculty and staff to empower them if they need to interact with students in potential crisis situations on campus. Leperi plans to share the crisis intervention strategies with his Effective Teacher Training classes, helping them feel more confident as they work with their future students. It will also be shared with students going into fields where they work with people under severe stress, such as Human Services and Criminal Justice. The philosophy of the NCIT program is "care, welfare, safety, and security for all involved in the crisis," according to Jeffrey Sorce, CPI senior account manager. "The emphasis is on prevention, de-escalation, and the use of physical intervention only as a last resort when an individual presents a danger to self or others," he said. Community colleges participating in the Nonviolent Crisis Intervention Training, in addition to CCCC, were Alamance, Bladen, Brunswick, Fayetteville Tech, Forsyth Tech, Piedmont, Rockingham, Sampson, Southeastern, Stanly, Wake Tech, and Wilkes. The grant also provides for the development of an online training programming on incorporating NCIT into curriculums. 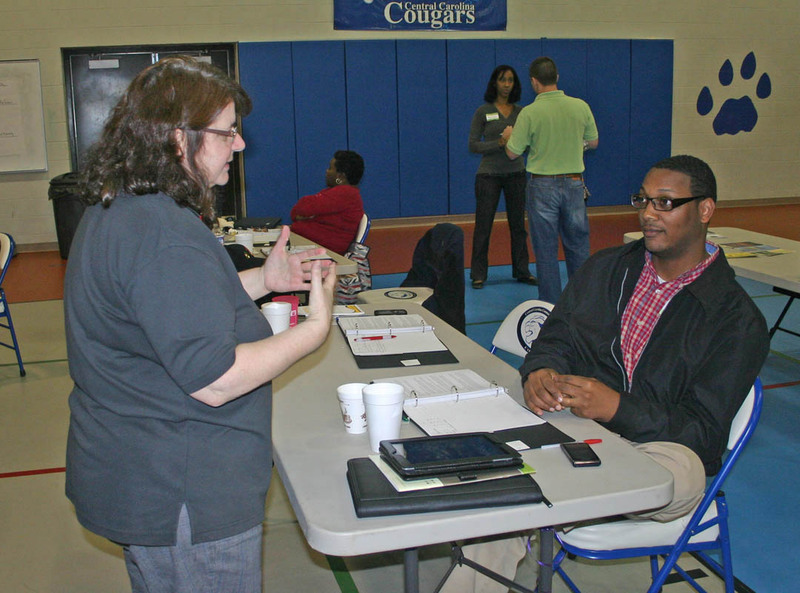 Anthony Thomas, coordinator of Recruitment and Admissions for Bladen Community College, said his college has a response team and the techniques he learned in the NCIT "Train the Trainer" workshop will be very useful. "We've gotten a lot of information at this training, "he said. "We've learned to defuse situations so individuals are not harmed. This is important to take back to our faculty and staff."